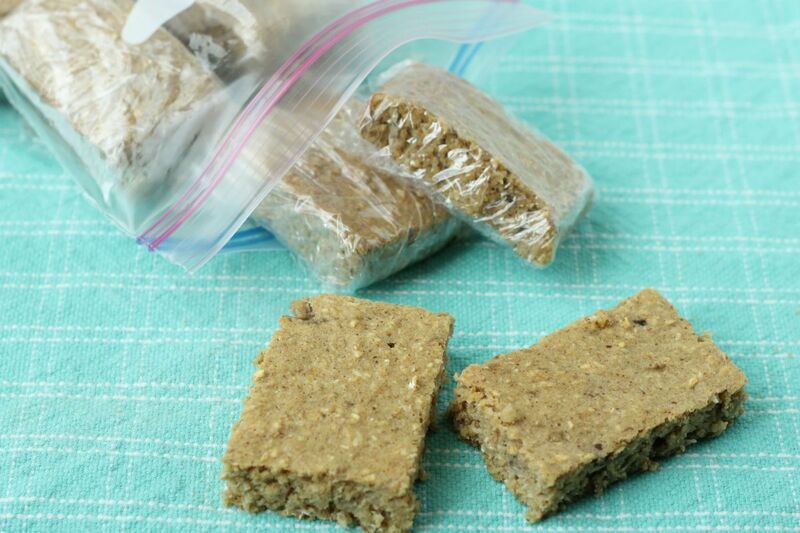 We have an awesome guest post from Amy of Yummy Toddler Food, here to help bring some peace back to your mornings without sacrificing the healthfulness: Kid-Friendly Banana Bread Oatmeal Bars! My two year old is a total morning person. She’s usually up way before the sun and comes into my room to wake me up with a gentle tap and a “Mama, I’m awake.” At 5 am, I’m not always at my best, but I gather my energy, give her a good morning hug, and make myself a cup of tea. We read books, play tea party, and sometimes build with her beloved Magna Tiles—which, combined with the things we actually have to do to be ready to leave the house at 8 sometimes means that breakfast is a little rushed. To avoid feeling too much morning stress, I try to have at least one pre-made breakfast option in the fridge. It could be Overnight Oats with Yogurt and Berries, Mini Egg and Cheese Muffins, or these Banana Bread Oatmeal Bars. We like these bars plain, topped with nut butter, or spread with cream cheese and a drizzle of honey as a quick breakfast option—or a sweet, yet wholesome afternoon snack. 1. 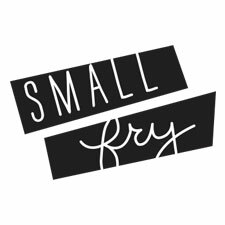 Preheat the oven to 350 F. Coat a 9×11-inch baking dish with nonstick spray (or use a paper towel to coat with canola or coconut oil). 2. Grind the oats in a food processor for about 30 seconds, or until they resemble a coarse flour. (They should look like quick oats or the ones in instant oatmeal packets). 3. Add the rest of the ingredients and process for about 1 minute, stopping to scrap down the sides of the processor as needed, until the batter is smooth. Pour into prepared pan, smoothing with a spatula so it’s even in the pan. Bake for 18-20 minutes, or until the edges are golden and a cake tester inserted into the center comes out clean. Let cool in the pan before slicing. Serve chilled or at room temperature. Storage: Wrap bars individually in plastic wrap and store in a zip top freezer bag in the fridge for up to 5 days or the freezer for up to 3 months. Serve chilled or warm slightly to serve from the fridge; warm for 30-45 seconds in the microwave, or until just thawed and heated through, from the freezer. Add 1/2 cup raisins or dark chocolate chips to the batter before pouring into the pan. Add 1/4 teaspoon nutmeg or ginger for additional spice. Use granulated sugar or honey instead of maple syrup if you prefer. Huge thanks to Amy for this awesome healthy breakfast option! Check out her site, full to the brim with awesome ideas just like this! 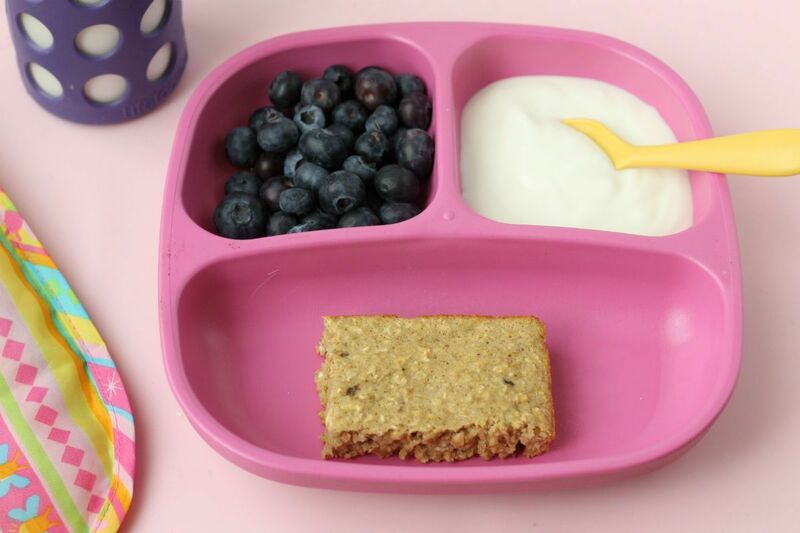 We also love her Instagram and Facebook (@yummytoddlerfood) feed for ideas on the go!